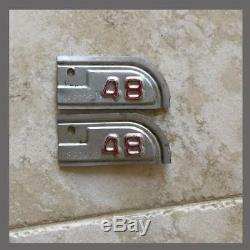 1948 California DMV License Plate Tags Pair Metal 1947. 1948 Original California YOM DMV License Plate Metal Corner Tags Pair. 2 tags with matching numbers. Use these tags on your 1947 plates for YOM. Registration of a 1948 model-year vehicle (you will need 2 tags - one for the front plate and one for the back plate). Please ask questions and check picture(s) carefully before purchasing. We specialize in dashes, steering wheels, grilles, license plates, and all the associated trim, etc. Other original items include seats, fenders, running boards, and bumpers. We have engine and mechanical accessories, as well as a nice selection of print memorabilia, brochures, dealer books, and other hard to find publications. Auctiva offers Free Image Hosting and Editing. The item "1948 California DMV License Plate Tags Pair Metal 1947" is in sale since Thursday, November 1, 2018.